Although IITA has made great progress in integrating gender in its research there is still a lot that needs to be done to transform the Institute to a lead center in gender research and development outcomes. 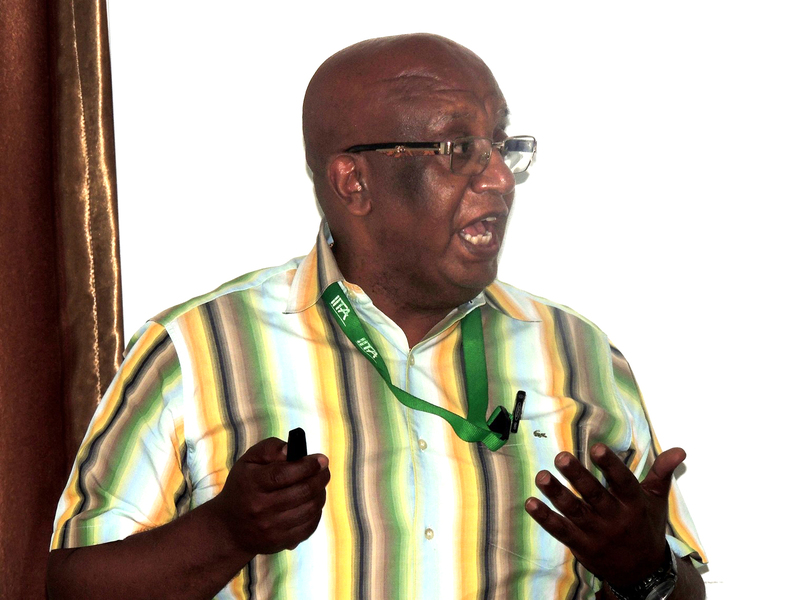 This was said by Dr Amare Tegbaru, IITA’s Gender Specialist, Unit Head and Humidtropics Gender Research Coordinator, during a seminar presentation entitled Engaging in IITA Gender Research aiming at enhancing equity and social inclusion in African Agriculture and Rural Development, held at IITA- Tanzania on 18 June 2015. “Gender is not just about numbers. It’s also about voices and access to assets and improvement in decision-making. IITA’s vision to reduce hunger and poverty and malnutrition through increasing the yield of important staples can happen only when gender concerns are taken seriously. Our quest to enhance efficiencies and improve nutrition in the continent will not happen if we do not understand the context. We also need to know how our efforts will affect women and how they will lead to gender equity between men and women and other marginalized groups,” he said. Dr Tegbaru speaking during the seminar. According to Dr Tegbaru, innovations in agriculture and Natural Resource Management (NRM) are constrained by existing gender norms which legitimize gender inequality in the control over and use of productive assets and resources. This holds back development. On the other hand, more gender-equitable control over and use of resources leads to higher levels of poverty reduction, food security, nutrition, and sustainable resource use. He gave examples of the Making agricultural innovations work for smallholder farmers affected by HIV and AIDS, in short, the MIRACLE project. This was implemented in Malawi, Mozambique, and Zambia, and sought to address the immediate health and nutritional needs of people living with HIV and AIDS. But in the end, the women who were marginalized and excluded owing to their HIV/status rose up in the community to become change agents and some were even elected as community leaders. that could effectively translate IITA’s science-based outcomes of change not only in terms of income and improved nutrition but also in enabling the empowerment of women and other marginalized groups in decision-making and change in social and power relations.